During the 2016 election, the Russian president made it very clear he was interested in an outcome that would spell the end of Obama-era sanctions. From the Republican side, he received assurances, perhaps even before the election night results were in. 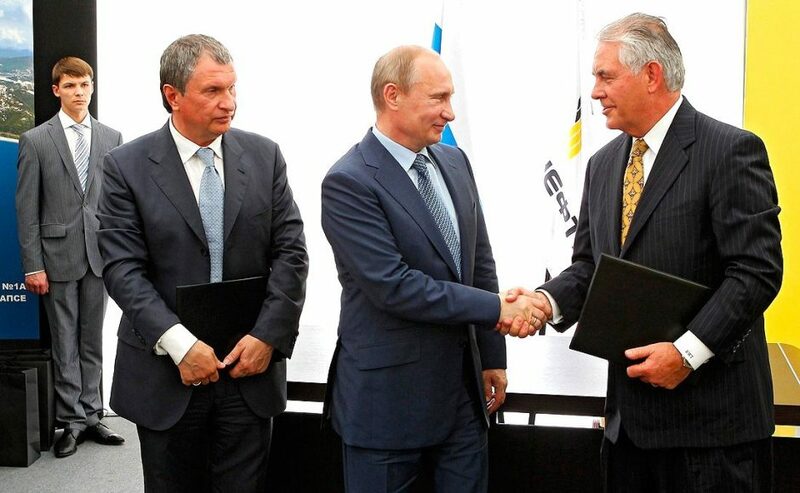 When the new U.S. president nominated the CEO of Exxon-Mobil, the Kremlin must have been ecstatic. Not only would the sanctions be lifted, but there appeared to be ample opportunity now to do some oily business with America. The United States is home to the second largest oil industry in the world. Russia is first. With the power wielded—and cover provided—by the U.S. secretary of state, the countries were free to collude cooperate on ventures to steer global petroleum markets. With all those tasks completed, the White House was able to move to the second phase of undermining the State Department. Earlier in the week the announcement came that CIA Director Mike Pompeo, a devout personal supporter of the president, will replace Tillerson and presumably continue dismantling the department. So, what I see developing in the United States of America is what will become known as the “Big Lie” era. The “big lie” is nothing new. Adolf Hitler—who is reportedly among the very few authors the president reads—was a fan and prodigious user of the propaganda that calls for the telling of lies “so colossal that no one would believe that someone could have the impudence to distort the truth so infamously.” (Mein Kampf, 1925) In post-2016 America, the colossal lies often come in the shape of people or personnel. Basically, the executive branch operates like a mob crime family. Everybody has a familiar job title, but their purpose—what they actually do for the godfather—is a closely held secret. Tillerson is a great example. Who has ever heard of an oil company executive qualified to earn the job of the nation’s secretary of state? It’s so preposterous (the big lie) that few dared to question his true purpose at such a post. And Hitler’s influence on the current administration doesn’t stop at the big lie. When the rumblings began that Russia and other actors were using social media to influence U.S. voters, the term “fake news” was used by social and mainstream media outlets to describe the practice. The candidate who would go on to win the election turned the tables. Almost immediately, he began using the term “fake news” to describe any unfavorable press about him. This propaganda strategy is merely a twist on Hitler’s infamous “accuse your opponents of what you yourself are doing.” The “fake news” that was (and is) being disseminated on the candidate’s behalf is now often overshadowed by his cries foul. My upcoming novel, ULTIMATE ERROR, is about the seemingly endless corruption and deceit that the many tentacles of the oil industry produce. Whatever touches petroleum or its related businesses becomes black, fossilized, and toxic.